A furnace burns propane or natural gas in a sealed combustion heat exchanger to heat the air in your duct work. A blower then blows this air over the sealed heat exchanger and throughout your entire house to provide you with warmth. The byproducts of burning these fuels are carbon dioxide and carbon monoxide gases. Both these gases are toxic in high quantities, with carbon monoxide being very toxic. To prevent these gases from entering the air in your home, they must be exhausted outside through a vent pipe. The vent pipe is typically made up of sheet-metal duct and is directed straight into your home's chimney. Remove the old vent pipe, if it's currently in place. Unscrew all connections and pull it out of the chimney. Discard all old pipe. Connect a length of vent pipe to the outlet on the furnace. Secure it with four sheet-metal screws. The length of pipe depends on how high you need the pipe to go before it turns horizontal. 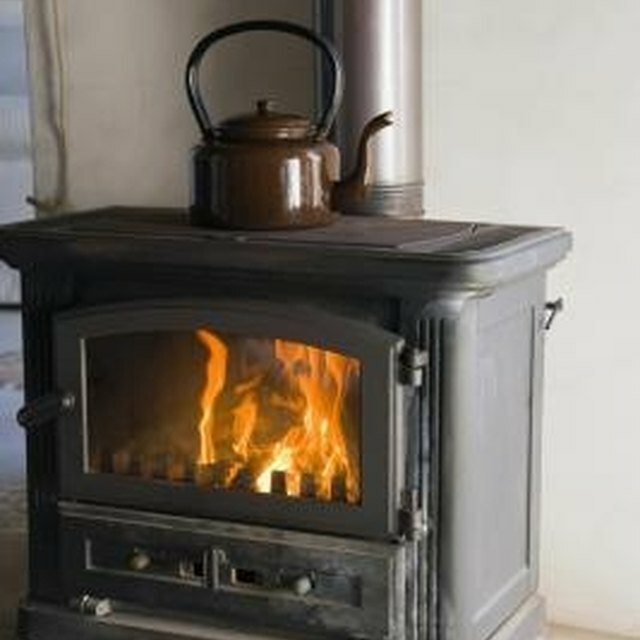 Install each successive length of pipe or elbow until your pipe is connected from the furnace to the chimney. Each connection is made by sliding the crimped portion of one pipe into the noncrimped end of the next pipe. It is then secured with four sheet-metal screws evenly spaced around the pipe. Apply a bead of high-temperature silicone caulk around each pipe connection and along each pipe seam. The bead should completely cover the seam to make the pipe airtight. Caulk around the pipe where it enters the chimney with high-temperature silicone caulk. Support your vent pipe if the length exceeds 5 feet. Wrap pipe strap around the pipe and secure it to itself. Run the other end up to a ceiling joist and screw it into the joist. The spacing between hangers should not exceed 5 feet. If you need lengths of pipe that are shorter than the standard factory length, cut the pipe down with snips. Once they're cut, crimp one end with your pipe crimper to allow for installation into the system. Your vent pipe needs to pitch upward at a rate of 1/4-inch per foot from the furnace to the chimney. If it does not pitch up at this rate, poisonous gases may escape from the furnace into your home.